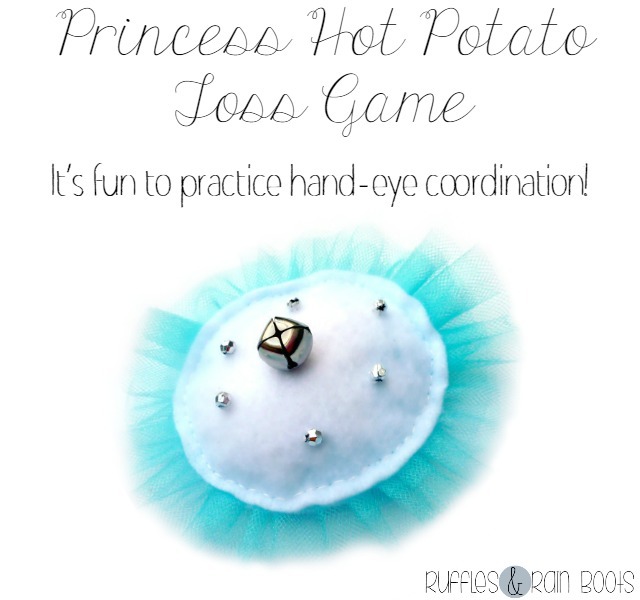 This princess toss game add a little girly fun to the traditional hot potato toss game. 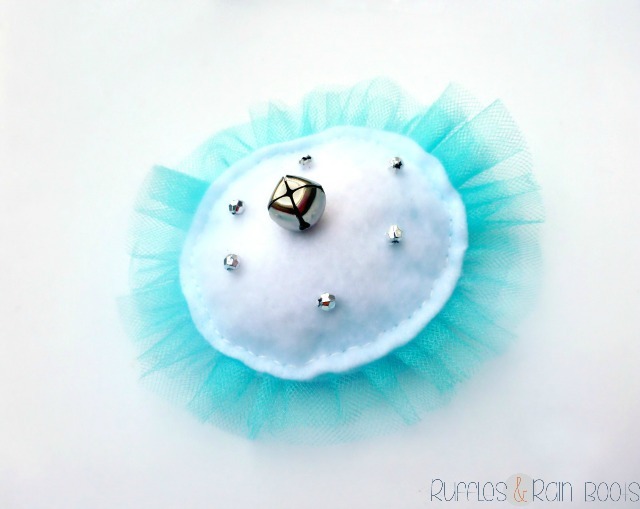 Let’s make this fun, frilly, and free-flying craft for kids. I decided to make a quick princess party toss game for Elise (2.5 years old) to play to help her physical development and hand-eye coordination. What is better to help build coordination than a game of catch? Not any game of catch will do for this little one; around here, we play ‘princess catch.’ It took almost no time to put together and was done using scraps and bobbles from Elise’s craft supplies while dinner was cooking. 2 same-size felt circles – Any size or colors will do. 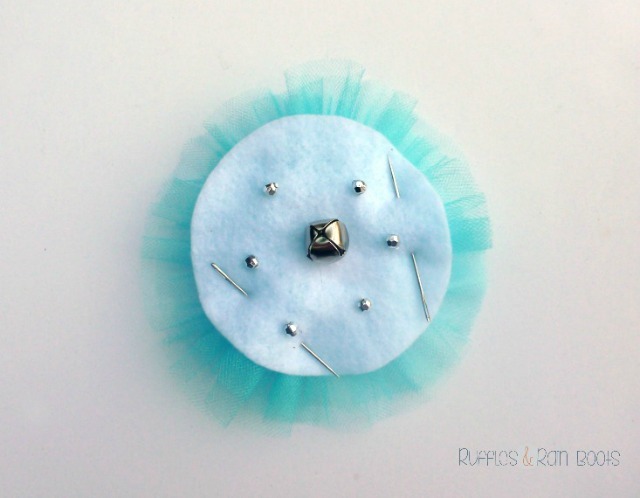 I used a light blue tulle because we are stuck in a 2.5 year old’s love of FROZEN’s Princess / Queen Elsa. I made my circles 3.5 inches in diameter because the plastic mason jar lid I grabbed to trace was that size. Tulle scraps – I used 3 inches x 34 inches, but you can use anything you can ruffle (including ribbon or fabric). Small, sparkly beads – I used 12 (6 on each side). 1 small bell – Obviously not necessary, but the tinkling of a bell sure seems princess-y, right? You can probably figure this out, but I took the pictures so here’s a tutorial. It is a simple – like ridiculously simple – tutorial, but hey – at least the pictures aren’t too fuzzy. Because I’ve just migrated to WordPress and don’t yet have my plug ins / coding straight, pretend there is a “Click to Tweet” kind of function right here. And yes, that’s an awful way of saying, “we would be thankful if you shared this on Twitter.” In my defense, I am learning WordPress as fast as my brain can absorb and have been working nearly non-stop on rolling out a new Ruffles and Rain Boots soon. 1. 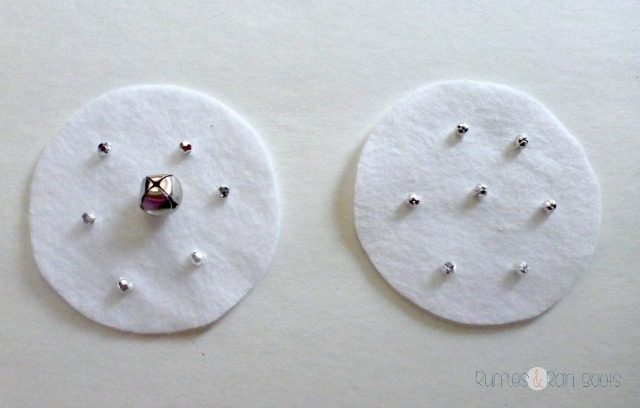 Sew the beads onto each felt circle, attaching the bell in the center of one. 2. 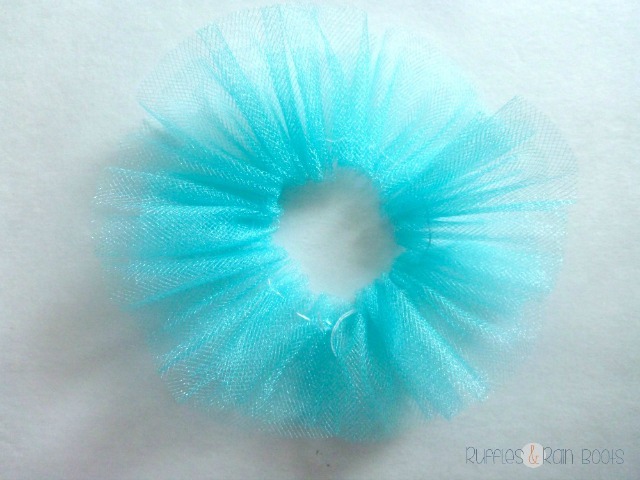 Fold the tulle in 1/2 lengthwise and then in 1/2 width-wise and pin to secure. Sew a gathering / basting stitch about an 1/8 of an inch from the folded edge through the length of the tulle. Gather the tulle by pulling on the thread. Tie it into a circle by joining the ends of the thread and creating a knot. 3. 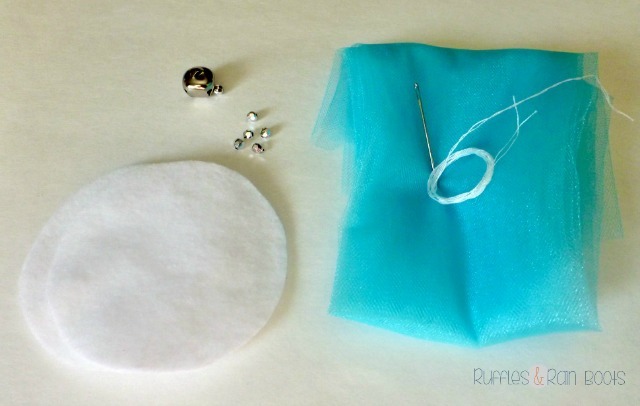 Layer the pieces in the following order: felt circle, tulle circle, and felt circle. The tulle circle will stick out from the edge of the felt. Secure the sandwich of princess perfection together and begin sewing around the edge of the felt using a back stitch (or whatever you want). I don’t really know much about hand-sewing and the back stitch is one of the few stitches I know. 4. When there is about 2 inches left to sew, stuff that princess pouf full of rice and stitch up the rest. Marvel at your quick, adorable creation for 4 seconds before your child absconds with it and begins playing an energetic game of princess hot potato with the dog. The dog was less than thrilled, but Elise was ecstatic! I’m thinking we’ll get quite a few sessions out of this scrap-buster project. Thank you for sharing your time with us today. To be sure you join us for all our princess-filled fun, don’t forget to sign up for our email newsletter. I so admire you creative people:) My little girl loves all things Frozen and princessy. Everyday, she wants to play dress up in some type of princess clothing. Really nice craft in such a few minutes! Thanks so much, Zan, and thank you for stopping by. I kind of got lost on your site awhile today and found so many tasty bites. I can’t wait to try that spiced rubbed chicken with apples! Ha ha…hopefully I would not disappointed you! Oh my gosh you know we like Princesses around here! I love this, my girls would love this. Thanks for sharing! I wish we were closer – I think our little girls could have themselves one heck of a princess-filled play date! I just stopped by to your wonderful party, Shirley, and added it to my parties link. If you’d like, come and link up tomorrow at the Thank Goodness It’s Thursday party here. How cute is this! I am totally intimidated by your craftiness! I realized after all of the awesome comments you’ve given me I had neglected to subscribe to your blog– I made sure to take care of that this time! Looking forward to more fun stuff like this! You are so busy, Brittany, if little things slip through from time to time, I’ll certainly give you a ‘pass.’ Thanks for commenting and glad you’re going to be hanging out with us! You make it look so easy! I love it. Having a girl is so fun! You get the best of both worlds, Leilani – boys and a girl! :) Thanks for stopping by today. This is so cute… and of course princess. COME ONE, COME ALL, RUFFLES & RAINBOOTS HOLDS ALL THINGS PRINCESS!!! I love how clear and straight-forward your tutorials are. PS – Your site looks fabulous Sarah! Very clean and elegant. Thanks so much, Jennifer. Apparently I am having some problems because I just tried commenting on a site and it said my IP was black listed (perhaps a plug in). Greaaaaaaaaaat. I have font issues all throughout the website even though I’ve changed the master font, spacing issues, and now I’ve got a problem with one of the two plug ins I installed myself. Awesome. I’ve run into glitches too (and have had my moments of missing Blogger). The dust will settle and I’m certain you’ll be pleased with your move. Delighted you linked up and shared this post at the #SHINEbloghop! Thanks!